CREDIT CARDS: We accept VISA, MasterCard, Discover and now American Express. We must have on all credit card orders the account number, expiration date, 3 digit code from the back of the card, the card holder’s name and address (zip code) as it appears on the monthly statement. C.O.D. ORDERS: UPS C.O.D. orders are no longer available. We are sorry for any inconvenience that this may cause. PREPAYMENT: When prepaying an order by mail we accept certified checks and money orders. Personal checks are held for bank clearance. RETURNED CHECKS: We will charge a $30.00 handling fee on all returned checks. If check is not made good within 10 days we will turn the check over to our collection agency. TELEPHONE ORDERS: Phone orders are gladly accepted. We do ask that you plan ahead for order before calling by filling out the order blank provided and read from it. Please use order lines for orders only. Order Forms come with SSS Catalog, if you need an order form they can Mailed or Faxed by request. MAIL ORDERS: To order by mail please fill out the order form provided completely. Please note year, model and anything else related to the parts you have ordered. If you have questions about your order, please give us a call before you mail your order form. FAX ORDERS: Fax orders and inquires are gladly accepted. Please fill out the order form provided completely. Please note year, model and anything else related to the parts you have ordered. You may wish to follow up with a Phone call to insure that Fax was received properly and/or to confirm your order. EMAIL: Orders and parts inquires Via the Internet are accepted, however we encourage folks to either Call your orders in for more personal service. Due to the volume of Email traffic we do ask that you direct your Tech Questions to: Call 937-525-0000 Ext.1, Fax to 937-525-9782 or to www.binderplanet.com go to "TechTalk". PLEASE NOTE: ALL ORDERS ARE PREPAID. CONTINENTAL UNITED STATES: All orders under $200.00 should include a 15% estimated shipping and handling charge, but no less than a $5.00 minimum. You if under estimate the shipping charges it could delay your order so you may wish to contact us before placing a mail order. Ohio residents should add 7% sales tax. Please call us with any questions concerning shipping charges. TRUCK SHIPMENTS: Some orders including many body parts, engines, etc. are too large for UPS and must be shipped by truck freight prepaid. Truck shipments average about $100.00 to $200.00 per order, Of course this depends on the weight of the shipment and your location. Your order will be shipped to the nearest Freight Depot for you to pickup. There is an substantial extra charge for home delivery, please call for estimate if you need the freight delivered to your door. We receive a 50%+ discount with Fed X Motor Freight Company. We will pass this discount on to your order shipment. All orders are considered final. Be sure when ordering that clarity is unquestionable. All Truck shipment orders must be prepaid in advance and then the order will be shipped freight prepaid. Any crating charges will be added to total bill. FOREIGN ORDERS: The entire order must be prepaid in advance in U.S.funds by using credit cards, money orders, or cashiers checks. Most foreign orders will be shipped USPS. There is an extra $10.00 handling charge on all foreign orders. All sales will be considered final. Be sure when ordering that clarity is unquestionable. Any crating charges will be added to total bill. Please allow extra time for special handling and shipping. DAMAGE CLAIMS It is the responsibility of the carrier for the delivery of the merchandise in good condition. Please inspect all deliveries in the presence of the carrier. If you receive an opened package or damaged package, have the carrier write "damaged" on the delivery sheet. Contact UPS or the Truck line so they can send a representative to inspect the damaged package immediately. That representative will then contact us and we will take the proper steps to file claims and/or replace the parts. In all cases of damage, the parcel must be inspected at the point of delivery. if this procedure is not followed, the carrier cannot be held liable for the claim on the damaged merchandise. REFUSED SHIPMENTS: Customer shall be charged all shipping and handling charges, shortage claims, and a 25% restocking fee on all refused shipments. We will not tolerate this kind of business. Thank you. OUR GOAL: Every member of Team SSS strives to deliver the best parts and service possible at a fair price, to insure you get value for the hard earned dollars you spend with us, we wish for nothing more than your total satisfaction with our company. 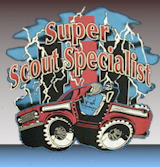 SSS is the proven leader in this industry and is proud to serve your needs. We hope to continue to earn your business.